Many papers have been published showing that people with diseases of all kinds might have problems with glutathione production in the body. In Addi and Cassi’s case, their fatal cellular cholesterol disease called Niemann Pick Type C is somehow disrupting their glutathione levels in their bodies. Over the past 9 months, we have been trying to correct this problem in the twins through administering a range of supplements. But how do you go about picking the right supplement to increase glutathione levels in the body? When you do Google search, hundreds of products pop up all claiming to produce instant results. Through my research, I have learned that raising glutathione levels in the body is not so easy. Simply taking Glutathione itself will not work. Glutathione (reduced state is called GSH) is an important intracellular free radical scavenger protecting cells against oxidative stress. It is considered one of the body’s primary antioxidants and is produced naturally from three amino acids: Glycine, Glutamine, and Cysteine. Glycine, Glutamine, and Cysteine are considered precursors of glutathione. Precursors are compounds that participate in the chemical reaction that produces another compound. N-AcetylCysteine, otherwise know as NAC, is the leading precursor to increasing glutathione levels in the body and can help replenish intracellular GSH levels. Once NAC enters the body, it is metabolized into glutathione. Glutathione can then function as the powerful antioxidant that it is. All NAC supplements are NOT the same. The problem I have run into with most over the counter NAC supplements is their packaging. NAC is a strong thiol-bearing compound prone to air oxidization. Once you open the bottle you bought on the Internet, the product has likely degraded since the time it was on the manufacturing line. Bioavailabilty (the amount that actually gets into your body) is likely low. There is a company called BioAdvantex in Canada that makes a pharmaceutical grade NAC supplement that comes in an effervescent tablet form (see photo). Think of an Alka Seltzer with a wild berry flavor. Each PharmaNAC fizzy tablet is individually wrapped in a special paper/plastic/foil material to keep moisture and air from entering the package. The manufacturing process is very well controlled to produce the most bioavialable form of NAC on the market today. Each tablet comes in 900mgs which I like. 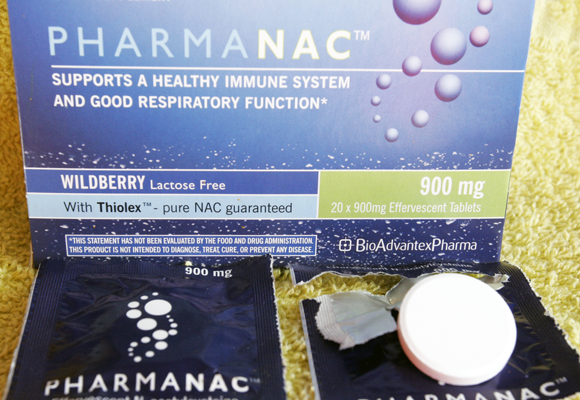 PharmaNAC is more expensive than other forms of NAC on the market. You can purchase it online at a cost of about $1 dollar a tablet. This is well worth the price because I don’t want to be putting supplements into my twins that have little chance of helping them. I also found this useful list of sources that may boost glutathione levels in the body naturally. Interestingly, one is called Curcumin, another compound I give to Addi and Cassi. Curcumin has some of the same issues as NAC in that all supplments on the market are not the same. I use the Curcumin developed by Dr. Greg Cole and Dr. Sally Frauchy at UCLA and made by Verdure Sciences — this is the most bioavailable form of Curcumin that I am aware of. Every once inside a while we pick blogs that we study. Listed below would be the most recent sites that we pick out….